Тhe one thing that can immediately and absolutely destroy your garden’s image is a rampant overgrown lawn. 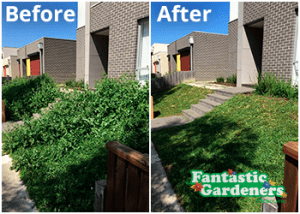 Fortunately, Fantastic Gardeners provide proven and affordable lawn mowing services in Melbourne to help busy people like you take proper care of their lawns. With years of providing lawn care services, you can always count on our local teams to mow the turf and keep it green, beautiful and healthy. From grass cutting to irrigation – We do it all! Free time: You won’t have to spend your weekend mowing the grass. A lawn service can potentially save two hours of work each week. Regular mowing: Keeping a tight lawn mowing schedule will discourage weed growth and make your turf hardier. Proper grass cutting: The lawn specialist will cut your grass to optimal length. This avoids weakening the turf and makes the grass less prone to disease. Proper tools: Sharp and properly maintained lawn mowing equipment will reduce the mechanical stress on the turf significantly thus also lowering the negative impact of trimming. Get in touch with us today to help you maintain the ideal lawn. Fantastic Gardeners provide a range of services for a complete garden care. On top of our lawn mowing in Melbourne, you can also take advantage of our tree services or green waste removal, and thus becoming eligible for a price reduction. Just contact us to learn more about our services and discounts. Weeding is an essential part of the whole gardening process. It could be quite complicated when there are deep-rooted weeds. This is no problem for the Fantastic Gardeners! We have the tools and know how to tackle any unwanted growth on your lawn. Proper irrigation doesn’t end with supplying water. For a verdant lawn and healthy plants designing an efficient delivery system that can last is a must. The irrigation system will be tailored to your property and turf to maximise efficiency and minimise water wasting.